CryptoSlate has today unearthed some new evidence from the Central Bank of the Bahamas which sheds doubts onto Tether’s claims that its stablecoin is backed up by USD. Earlier this week, Tether gave seemingly convincing evidence that they indeed had, as they have always claimed, stashed enough money in a Bahamian bank to backup every single one of their USDT stablecoins, a claim which has consistently been questioned by skeptics. Case closed, right? 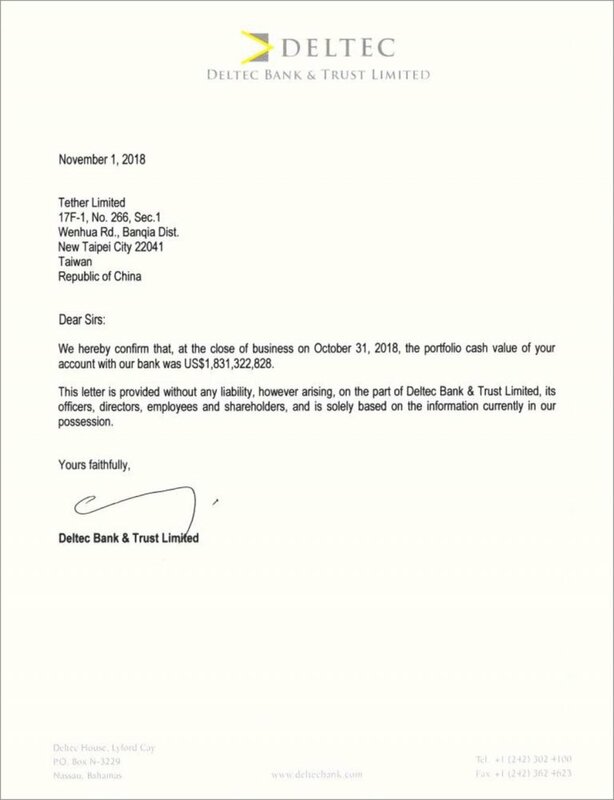 The evidence which Tether points to in order to prove their holdings center around a letter which contains a claimed confirmation from the Bahamian Deltec bank which states that Tether indeed holds $1,831,322,828 - enough to ensure every last Tether stablecoin. CryptoSlate points out that not only does the document not contain any signatures or other proof of authorship (or even the name of anyone in particular from the bank) but Deltec has in fact not confirmed or denied their relationship with Tether. While this might mean that the letter is not a silver-bullet for Tether’s holdings authenticity, perhaps more worrying for USDT holders is that Tether’s deposits into the Bahamas are not reflected in economic reports from the island's government, whose economy is small enough that a $1.8 Billion deposit should show a demonstrable effect on Bahamian economic data. The deposit that Tether claims to have made in Deltec would show up as an ‘M2 holding,’ which are publicly available. If Tether had deposited the money when they said they did, then the M2 holdings should have increased by $1.8 billion between November and June. The M2 holdings did not see a large change, and cross-referencing the change in foreign investment (which, in theory, might account for the lack of change in the M2 figure) didn't show that a large sum of money was taken out of investment. The full report from CryptoSlate has more details, and lays a convincing case that Tether hasn’t fully proven that each USDT is backed up. While CryptoSlate isn’t directly accusing Tether of lying, it does convincingly show that there is still some room for doubt. Because the M2 figure didn’t change, and because there was no confirmation from the bank representatives, there is no direct evidence that Tether really does have the cash to back up its USDT token. This doesn’t mean that it doesn’t have the funds, and the fact is that there is also no direct evidence it does NOT have the funds it claims- it simply can’t be directly verified either way. In fact, some sleuths on Twitter have even pointed to some movement of funds in and out of Bahamanian national banks as possible indication that Tether purposely deposited money into the Bahamas, only to quickly move it out in order to use those ledgers as evidence that they had the funds all along. 5/ More interestingly, the money appears to have left the Bahamas almost as quickly as it came in! Tether might be able to prove that it really has the funds, but it hasn't yet done so - and Tether’s critics are likely not going to be silenced until that incontrovertible proof is fully laid bare. Does Tether really have its USDT backed up? Greedy journalists and Tether's competitors still trying to undermine it. I don't suppose that this screenshot with "publicly available" data is a good evidence. If it is publicly available then why wouldn't you provide a direct link on that DB? OH MY GOD Only in november you have posted an article that Deltec had indeed confirmed that paper https://www.chepicap.com/en/news/4992/deltec-finally-confirms-authenticity-of-letter-regarding-tether.html Are you kidding me? Oh wow, more doubts. You know, it's just looks like a vicious circle to me. First they say that there's a report on tether and it's backed, then they say that the report is wrong and tether is not backed. And it just goes on and on and there's really no proper distinct facts. anyway it's so ...soo... suspicious 4 me. i don't think tether has any manipulates with market - BF (bitfinex) which created it too weak to manipulate it. it's just my minds for now. anyway it's so ...soo... suspicious 4 me. i don't think tether has any manipulates with market - BF (bitfinex) which created it too weak to manipulate it. it's just my minds for now. but where are all evidences??????? i do not see them! Everyone knows that Tether has no any similar analogs. Moreover, we see the news and necessary confirmation of the financial status of Tether. Taking the above I conclude that Tether is a reliable stablecoin. I don't see any reasons not to trust Tether so I think yes, it is a reliable stablecoin and it has the necessary funds. I believe to Tethers team. they are doing good job. I believe to Tethers team. they are doing good job. congrats! As for me Tether is the most reliable stablecoin and I trust such information. I keep and eye on the market and don't see any negative reasons not to trust tether. I'm sure that Tether is the best stablecoin nowadays. As for me it's absolutely clear. This is the only way to blame tether.